The night sky is full of mysteries. For centuries, humanity has gazed into the black of night and wondered at what it was seeing. Early astronomers charted the heavens, recording the minutest of details about the cosmos as they saw it. Today one can go to archaeological sites around the world and find ancient buildings aligned perfectly with the stars in the sky or with annual events such as the summer or winter solstice. Because of this attention to detail, any anomaly has caught the star gazers’ attention, causing new theories to be cast to explain new observations. Human nature, on the other hand, has shown itself to be capable of following fancy, of sharing in mass panic. Between 1896 and 1897, the entire country found itself in the grips of UFO mania, a mania that even ensnared the state of Arkansas. The story begins in California on November 17, 1896, when people in Sacramento reported seeing a large floating light in the sky. Some who saw the strange object reported hearing the sound of singing and noises as if a great celebration was taking place on board the airship. Although the local press greeted the story with skepticism, soon the sightings spread across California for the remainder of 1896. In February, 1897, the mysterious sightings spread into the Midwest as the airship was sighted in Nebraska and Kansas. In March, it was spotted floating above Kansas City, Missouri. By April, Canada got into the action when people in Manitoba also reported seeing the object. As the stories of airships in the sky spread, the sightings grew more elaborate. Those who saw the airship in Abilene, Texas, reported that they heard the sound of a full orchestra coming from the craft. Witnesses in a few locations claimed to even talk to the pilot. Still, another account in Aurora, Texas claimed that the airship crashed on a farm and the pilot was killed. Although the pilot’s body was burned in the crash, the Dallas Morning News reported that there was enough left of him to prove that he was “not an inhabitant of this planet.” Legend has it that the pilot is buried in an unmarked grave on that farm to this day. Soon the sightings began in Arkansas. On April 17, 1897, children playing outside in Texarkana’s warm early spring evening noted seeing the airship in the sky. They quickly alerted their father, J.F. Floyd. 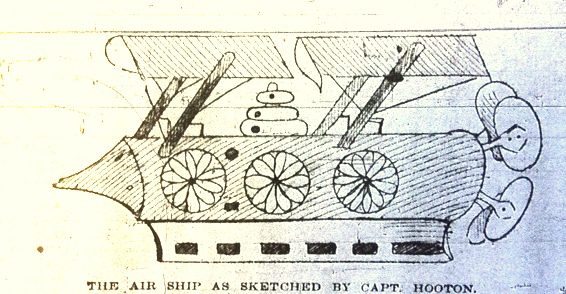 Floyd told the Daily Texarkanian newspaper that he was unable to describe the airship in much detail. He noted that it appeared as “a huge ball of fire traveling with fearful velocity.” While Floyd’s story lacked much detail, a few days later, Iron Mountain Railroad conductor Captain Jim Hooton reported to the Arkansas Gazette that he had come across the airship in the woods while on a hunting trip near Homan, in Miller County. He told reporters that he spotted the airship landed in a field. When he approached, the pilot and his crew came out of the ship. Hooton asked them if this was the ship that had been seen across the country and the pilot said it was. Then a crew member told the pilot that the ship was ready to go and then it blasted off into the sky. Hooton got a good enough look at the airship to make a sketch of it for the newspaper. Perhaps the most prominent of the sightings in Arkansas came on May 7, 1897, near Hot Springs. Deputy Sheriff McLemore and Constable Sumpter were out trying to serve a court subpoena when they saw the airship approach and descend to the ground. They saw the pilot, who they described as a tall man with a long black beard, filling the airship with water from a nearby stream. The pilot invited them to come on board and take a ride, which they declined. To prove their story’s authenticity, the lawmen swore out legal affidavits telling the tale. So, what can be said about this series of events? Were there really UFOs from another planet making their way to earth on an intergalactic summer vacation trip? What were people seeing throughout the country that spring? It is quite easy to discount the account from a group of possibly inebriated witnesses, but not all of the witnesses had just stumbled out of a saloon. It is possible that many of the witnesses were possibly telling tall tales to get publicity; or maybe they were wrapped up in the hysteria of the moment. Another possibility was that they really were seeing something. That spring there were reports in the newspaper about an airship built by a Professor Bayard that was to debut in Nashville, Tennessee, at a science exposition. Although this was years before the Wright Brothers’ flight at Kitty Hawk, North Carolina, there had been numerous inventors during this time period who built experimental aircraft. None of them, however, were capable of prolonged air travel. 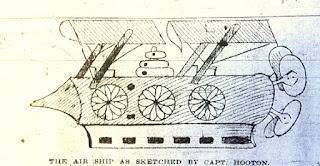 Bayard’s airship, however, would explain the cases where witnesses claimed to speak to the pilot. So, there may be some truth to some of the sightings. What is certainly interesting about the rash of sightings is that it seems that none of them attributed the airship to otherworldly creatures. In fact, of the surviving newspaper accounts, they almost exclusively attribute the airship to an unknown human inventor. The only sighting claimed to be from space was the report of the crash from Aurora, Texas, and that account is problematic because the sightings continued across the country at least a month after the supposed crash. Nevertheless, possibly the constant press reporting fueled the hysteria that spring causing people to think that anything that seemed out of the usual, a shooting star for instance, was the airship that was so constantly in the news. Nevertheless, the rash of UFO sightings would be repeated again and again for the next 120 years. Maybe it was hysteria driven simply by media hype? If so, it was one of the first great examples of mass hysteria driven by unidentified flying objects. Or maybe, if one visited bath house row that summer, one might have caught a glimpse of a little green man, wrapped in a towel, enjoying a little relaxing trip to the spas?